Christmas Eve 1938 marked the birth of an enduring institution in the community life of Dungarvan and West Waterford. That chill winterish day John B. Nagle and Jack J. Troy oversaw the production of the first edition of the 'Dungarvan Leader' to roll off the clanking presses at 78 O'Connell Street. Ever since, the 'Leader' has recorded community events and news items, many minor, some major, but all of vital importance to the people it serves. Through seven decades and three generations of local family ownership, first by John B. Nagle, then by his son, Michael J. Nagle, and since 1993 by Colm Nagle, it has proven an impartial and trustworthy recorder of the changes to the social and built fabric of the town and the wider community. In the Dungarvan Leader's first fifty years, local, national and sometimes international political affairs were all recorded in four broadsheet pages, and the news of the day was analysed by trusted commentators like 'Spotlight' and 'Pensman'. Their concise, analytical, sometimes critical, but always impartial views, were parsed over and discussed at length by readers from Kilmacthomas to Tallow and by the many hundreds of emigrant sons and daughters of West Waterford who lived in America, England, Europe, Australia and Africa - truly the Social Media of its day. But times change, and the Dungarvan Leader has taken brave and innovative steps to embrace and take advantage of those changes. In 1988, the Dungarvan Leader became the first newspaper in Ireland to embrace the computer age, switching from old style printing to desktop publishing and on-screen make-up, a bold step, but one replicated in subsequent years by national and regional papers across the country. It enabled the addition of more pages, more pictures and features whilst maintaining quality of content. The move paid off. As circulation steadily climbed more content was added, and a new era dawned for the 'Leader'. That drive to innovate and to keep pace with the times continues to this day. 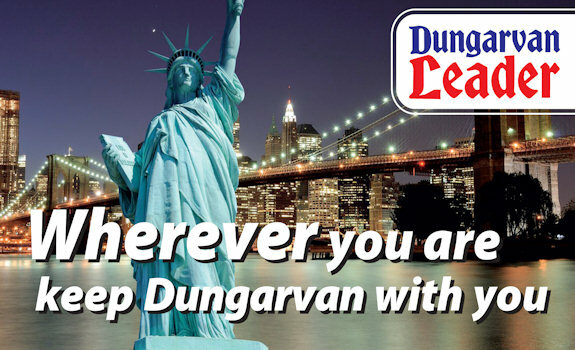 In 2008, the 'Dungarvan Leader' launched a cutting edge website, allowing Ireland's new emigrants based anywhere in the world to access each edition at 7 a.m. every Wednesday morning. This state of the art website brings Dungarvan and West Waterford to a global audience every week, and allows subscribers to view the Leader in its entirety from their computer in the very same way as reading the paper from the newsstands. As the media landscape changes, the 'Leader' continues to evolve. By being creative, bold and innovative, readership has continued to grow despite a challenging economic environment. But in over 70 years of existence, its central focus has never shifted. It remains proud to be THE PAPER FOR ALL THE FAMILY.